Yes Today was previewed yesterday, at Nublu, located in New York’s Lower East Side, as part of Freelance’s monthly residency, which has been playing to sold-out rooms throughout the city for the past several months. On May 10, the group will return to Nublu to celebrate Yes Today’s official release. Freelance features an all-star lineup of musicians that regularly accompany Grammy Award winning artists such as Robert Glasper, Solange, Estelle, Esperanza Spalding, Terence Blanchard, Bilal, Terrace Martin, Lalah Hathaway, and more. Comprised of founding leaders Smithsoneon (vocals) and Ausar the Ambassador (keyboards) along with Craig Hill (saxophone), Yasser Tejeda (guitar) and David “Dj” Ginyard (bass) and Justin Tyson (drums), Freelance’s sound is born from the sonic footprints of Mint Condition, Earth Wind and Fire, Stevie Wonder, Radiohead, and Robert Glasper. Also featured on a number of tracks is harpist Brandee Younger, organist Mitch Henry and acclaimed trumpeter (and band mentor) Darren Barrett who is highlighted on “Band Plays On”, among others. The album was mixed by world-class producer and drummer Charles Haynes aka Chally Mikes. 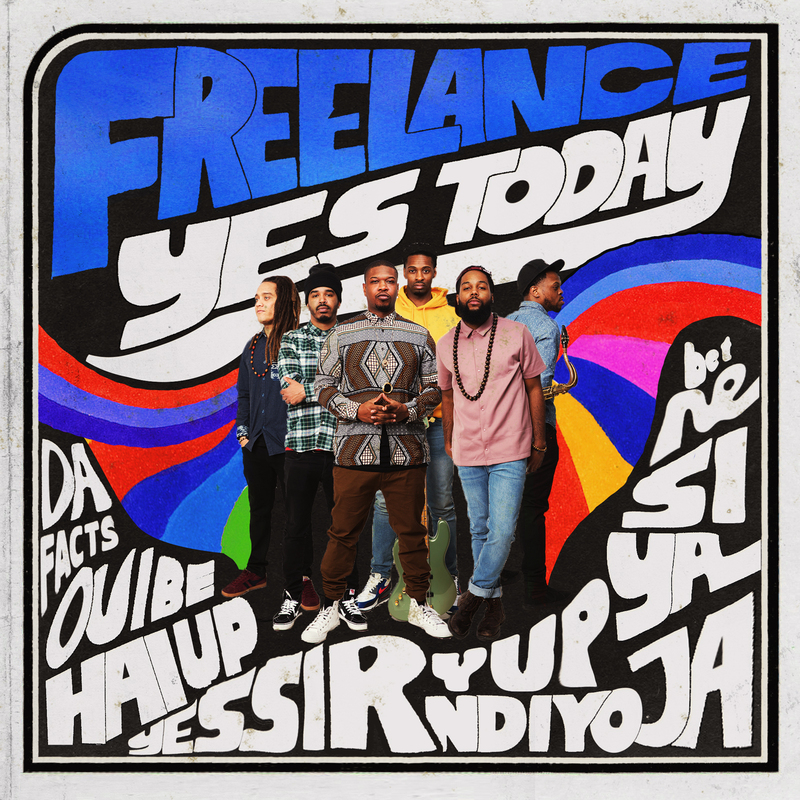 Yes Today is a collection of songs that speak to the evolution of Freelance and their myriad influences. The genre-defying collective lend their ideals and polychromatic musical aesthetic to the tasks of speaking truth to power, pushing the envelope with forward production and capturing the energy of their live shows on record. Funded by a Kickstarter campaign and revenue generated by the band, Yes Today found Freelance returning to their undergraduate stomping ground to record at the Herd Studio in Boston. The energy of Yes Today is perhaps best exemplified in the album’s lead single, “Band Plays On”. Premiered on March 30th via Revive.com, “Band Plays On” pulls music cues from Michael Jackson’s “Off The Wall” while speaking to the feeling we all experience when our favorite song magically alleviates the worries of everyday life. On the infectious single, which was mixed by Grammy-award winning engineer Ben Kane, each member of Freelance is highlighted; Smithsoneon’s powerful vocals and Ginyard’s carefully placed bass fills and provide an anchor while Ausar the Ambassador’s synth patches add lush textures. Tejeda’s steady guitar work and Tyson’s distinctive drum groove compliment the EWF-esque gorns led by Hill. Other standout tracks include the post-punk empowerment anthem “Why Wait”, which channels a J Dilla join and Michael Jackson’s “They Don’t Really Care About Us”, and the album’s eighth offering “What We Fear”, which is Freelance’s response to extrajudicial violence. The release of Yes Today marks REVIVE Music’s launch of its independent label division. “…To launch this venture with such brilliant musicians and songwriters is exactly the path to take the REVIVE Music Group to places unimagined. We are so proud to be a part of bringing this great project to the world via our platforms.” says industry veteran and EVP of REVIVE Music Guy Routte. To date, REVIVE has released three albums under its imprint with Blue Note Records which has featured an astonishing array of featured artists which include Otis Brown III, Bilal, Gretchen Parleto, Derrick Hodge, Marcus Strickland, Meshell N’Degeocello, Keyon Harrold, Brandee Younger, Casey Benjamin, Raymond Angry, Justin Brown and many more. Their 2015 RCA Nina Simone Revisited partnered release produced by Robert Glasper featured artists Lauryn Hill, Usher, Mary J Blige, Gregory Porter, Common, Alice Smith, and more.